This is a name of Viking and Olde English origins which is both topographical and job descriptive. 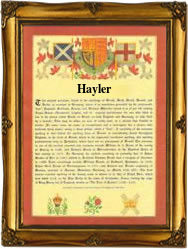 It derives from the words 'heall or halh' and means 'one who lives or works at the hall'. However, 'hall' itself has many meanings and can refer to a noble's house or a corner of land or a water meadow or even a slope! There are many spellings including: Hailler recorded in 1713, Haler in 1690, although one of the early records shows that in 1583, Juliana Hayler married Joseph Ley at St. Mary on the Hill, London. The first recorded spelling of the family name is shown to be that of Robert Haller. which was dated 1332 The Pipe Rolls of Surrey. during the reign of King Edward III 'The Father of the Navy' 1327-1377. Surnames became necessary when governments introduced personal taxation. In England this was known as Poll Tax. Throughout the centuries, surnames in every country have continued to "develop" often leading to astonishing variants of the original spelling.